By popular request, I’m reposting this updated for 2017. It’s exactly the same as last year, only the dates are updated in the spreadsheet (I didn’t update the screenshots, so sue me). I do have a slightly different system I’m personally using this year that I’ll share when I get a chance but the basic format is the same so go ahead and start with this and you’ll be able to move your data over easily to the new sheet if you want to. I’m aware that there is no February 29, 2017 but I leave the leap day in every year so I don’t have to redo the spreadsheet. Just hide or ignore that row and proceed accordingly. It’s no secret that I write A LOT, across a bunch of different genres, despite the fact that I have very little time for said writing and regular readers know that’s because I have a very involved writing system that involves setting a word count goal for the year, with mini goals for each month, to keep me on track. Every year, my Wrimos ask to how they can keep the motivation and creative frenzy of NaNoWriMo going once November is over and if the kind of gamification and deadlines of NaNoWriMo works for you, this system takes that and expands to the entire rest of the year. The idea is to keep you focused on the goal of writing regularly and to make writing a habit in your life. The more you write, the better you get, so if you’re not already writing regularly, that’s something you must correct! Notice I said regularly and not daily. There’s a ton of writing advice that’ll tell you you have to write daily, and if that works for you, great! I don’t have that kind of nicely ordered life. I have never written daily (and, frankly, I’m a bit of a binge writer) but the yearly goal lets me take breaks and catch up as needed because there’s plenty of breathing room. And before you put on your scoff pants, take a look at how this system has increased how much I write in the last five years I’ve been doing it. I went from struggling to hit the NaNoWriMo goal of 50,000 words in a month to doing 50k or greater every month without breaking a sweat. What this system mostly does is track your daily word count over multiple projects and help you look at how much of your writing is Focused (ie. freelance work, work on projects you intend to publish, etc) and how much is Free (journal entries, research, blogging, etc). While you don’t want to stop yourself from doing Free or unfocused writing (any writing is good to keep your writing muscles working! ), it’s very easy to fall into the trap of doing more unfocused writing than anything productive and the idea is to be aware of how you’re balancing the two. I like to shoot to keep my Free writing under 50% of my total writing. Lastly, this system has one potentially controversial element and that’s how it tracks editing. It tracks editing by time. I keep track of my average words per hour and value editing at half this. The idea is that I can just set a timer and work on getting the words right without having to worry about word count (especially since the word count is usually decreasing with editing anyway). I also use the free program ManicTime to track only the moments when I was actually in my document working and just input exactly how long ManicTime says I used my writing program so I know I’m being truthful on the time I spent working… versus looking at Facebook or whatever. I added this element to the system years ago because, without it, focusing on word count only almost penalizes you for editing which makes no sense as revision is often the hardest to motivate yourself to do! But if you have your own way of tracking editing, just hide the column and don’t use that part. Before we get into exactly how this all works, understand this: This system works for me. I developed it for me and my writing process. You’re not me. Feel free to change or modify it as needed to fit your needs. But if you’ve never had luck developing a regular writing habit and you don’t really have a system of your own yet, I urge you to give this a try for a least a month or two. That’s long enough to know what you’d need to change about it to make it work for you and to get used to writing often enough that it becomes a natural habit instead of a chore. 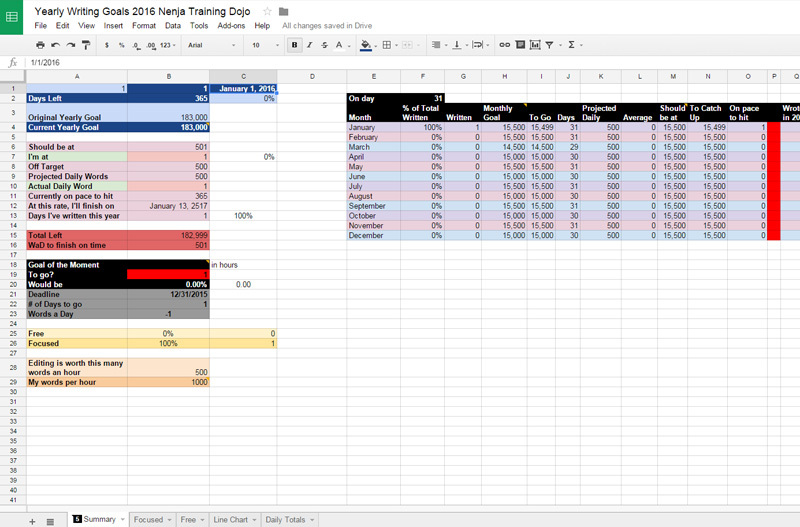 I call this system the Nenja Training Dojo because I’m a dork and also because my NaNoWriMo region is N(orth) E(ast) N(ew) J(ersey) and our nickname is the Word Nenjas. A ninja cannot defeat their enemies in the great battle without dedication and steady practice the rest of the year. In the same way, no matter where we are in our careers, we all want to write more and better and with quantity comes quality. The Nenja Dojo is about building up a regular writing habit and motivating you to keep practicing your writing year round instead of just once in a while. Name the copy whatever you want. That will now reside to your Google Drive account where you can access it at any time to update it. Fields designated below are editable. Everything else automatically calculates so you’re probably not going to want to touch it unless you’re spreadsheet savvy, including the names of the sheets. Most of this sheet automatically calculates but there are a few editable fields (which are marked on the spreadsheet by comments to help you find them). 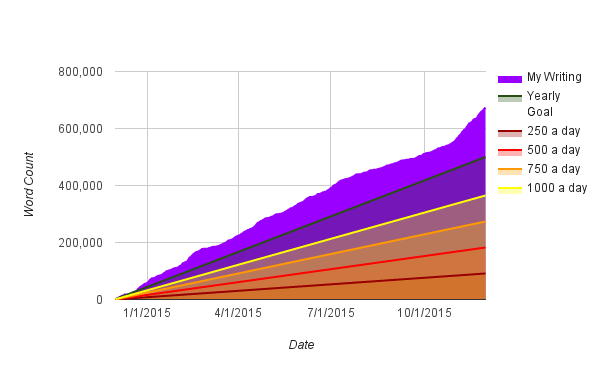 Current Yearly Goal: Input your writing goal for the entire year. If you’ve never set a writing goal for the year before, aim low to start with. You can always increase it if you find it too easy. Common writing advice is to write 250-500 words a day which adds up to 91,500-183,000 for the year so anywhere in that range is a great first time goal. As you NaNo veterans know, 250-500 words is doable in just a wee little 15 minute sprint a day so it’s a challenging, but very attainable task. If you want to change your goal later, this is the field to edit. Goal of the Moment: This is designed for smaller mid-way progress goals. (For example, if you want to reach a milestone word count by the end of the week.) You can edit the goal and the deadline and it will show you your progress towards it. Monthly Goal: On the upper right are stats for monthly goals. The Monthly Goal column defaults to being auto calculated based on your Yearly Word Count Goal but you can overwrite that and manually input any goal you want for any given month. The Should be at, On Pace to hit & Your Daily columns all calculate based on the day of the current month so ignore what it says for every month but the current one. Because they start to show wacky numbers once a month passes, I like to change them to static entries as soon as I finish a month. Focused Sheet. Oooo! Pretty colors! This is the meat of the spreadsheet. Every day that you write, you can input your progress on the spreadsheet and it will automatically calculate everything else. There’s room for several works in progress at the moment but feel free to add more or only use one column as needed. (Just keep in mind that, if you add more, you’ll need to edit the hidden cells to make sure they’re getting added into the totals.) You can use a column for each project (such as individual novel titles) or just make them general categories like Blog Posts, Short Stories, Novels, etc. I use project titles for big projects, such as individual novels, but categories for Focused things like Freelance Work or Short Plays or Free things like Blog Posts, Novel Research or Journal Entries. Word Count: This is for inputting how many words you wrote that day. Editing: While I log true rewriting (such as when I completely start a section over from scratch) in the word count section, I log editing and revising by time. I highly recommend free programs like RescueTime or Manictime that passively track your work in the background for this because they give you a more honest idea of how much you actually worked (vs surfed the net) and are less distracting than trying to keep track of the time yourself so that you can just concentrate on writing. I prefer ManicTime because even the free version lets you tag projects and keeps track of individual documents instead of just the program but it can be a system hog sometimes & doesn’t work on mobile or sync between multiple machines. I usually end up using both in combination. At the end of the day, if ManicTime tells me I spent 1 hour and 15 minutes and 3 seconds in my novel, I input that exactly into the spreadsheet as 01:15:03. (FYI, the time has to be formatted exactly in 00:00:00 or Google Sheets has a fit.) This spreadsheet is designed to translate this time into word count using your average words per minute. Duration: This does not factor into your daily word count in any way. 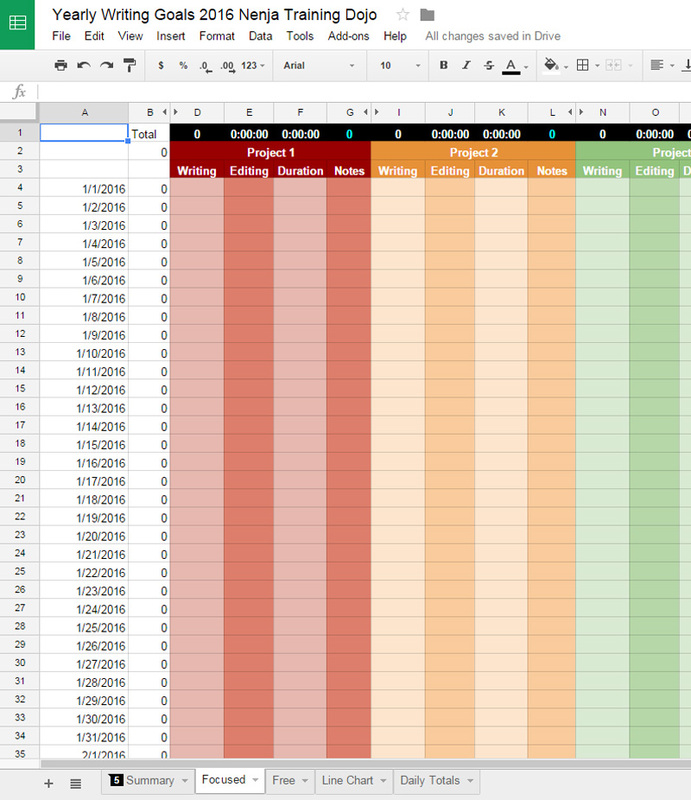 It’s just for your reference if you want to use it to track editing or revision progress. It’s also handy for calculating your average words per hour if you remember to log both time spent and how many words for every writing session. Notes: The spot for notes to yourself. For example, you might write “First day trying 3rd person POV,” specify which project you worked on if you’re using more general categories (ie, my entry under the header Short Plays, would read “She-Bear” for today), or it can just be more general talking to yourself (“Ugh, this story isn’t working, waaa!” -me, everyday). Outside of the project name and daily Word Count, Editing and Duration columns, everything else on this page automatically calculates. What’s the difference between Free and Focused Writing? 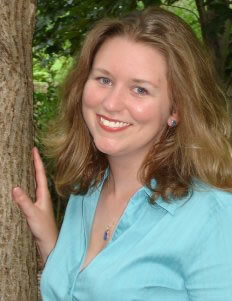 Focused writing is writing towards a goal, such as publication or production (I’m a playwright). For me, this category includes plays, novels and my non-fiction books. Free writing is writing for writing’s sake. Blog posts and journal entries are the obvious ones but I also include Research, Writing for Others (such as Beta Reading & Comments), and sometimes writing career related emails (such as if I have to write a really long email to a director of one of my shows, write-up a mailing list blast or craft a query letter). You can decide for yourself if you want to rename these categories or how you personally define them. Line Chart. Wow! You wrote a lot! Just kidding, that’s mine from last year. This is a visual representation of your writing progress for the year to help you identify trends in your writing and see how you’re progressing. This backstage sheet is what makes the charts and other features work. Unless you know what you’re doing, making changes on this sheet will only mess everything up on the other sheets. If you’re thinking it seems too easy, that’s because it’s all based on the very simple and very effective idea that you’re more likely to stick to something if you hold yourself accountable. Give it a try and you’ll be surprised how much simply keeping track of how much you’re writing with a goal in mind can increase how much you write and make you more likely to get it done! Questions? Post them below instead of in a private message because if you’re wondering it, chances are, someone else is too! Also, this system and spreadsheet took me MANY hours to create so thanks and shares of this post are always appreciated! PS: If anyone wants to replicate the community/competitive nature of NaNoWriMo and pit their yearly/monthly word counts against others, please let me know! I set up a system for it for my region who wasn’t interested but I can bring it back if there’s interest!